My wicked problem is bigger than yours! The fact that health costs will consume the entire State Government budget in less than 25 years is a wicked problem* that precipitated the South Australian (SA) Government to explore a new approach to improving the health and wellbeing of the population. Climate change might be an even bigger wicked problem, but the unsustainable growth in health care costs is a more urgent threat. It is likely to be even more immediate than indicated in the graph below as forecasts of health costs tend to follow previous trends in costs of treating diseases only. For example, the trend in decline in cardiovascular disease rates would reduce costs but the (yet another) wicked problem of obesity is yet to make its large presence fully felt with the weight of chronic diseases that it induces. Thus progress in one area is likely to be overwhelmed by costly health problems elsewhere. Moreover, energy costs, the negative influence of economic turmoil, and the injuries and deaths from extreme weather events are rarely considered in forward estimates of health care costs as they are hard to predict. This approach, coined ‘Health in All Policies” (HiAP) was incorporated into the latest European Health Strategy and is progressively being implemented by all member countries of the European Union. In a nutshell the HiAP approach actively encourages all government agencies to incorporate health, well-being and equity impacts in their policies and plans. In South Australia it is not just a nice idea, but is a commitment by all heads of department spelt out in the State’s Strategic Plan. Having the Premiers’ endorsement and support was critical in SA becoming recognised as a leader in adopting the HiAP approach. This ultimately led to the establishment of a HiAP Unit within the SA Health Department. In 2010, the World Health Organization (WHO) and the Government of South Australia co-convened an international meeting on HiAP, where the need for new skills and competencies in public health were discussed and documented in the Adelaide Statement on HiAP. As a result of this need, the first HiAP international Summer School was held over five days between 28th Nov – 2nd Dec this year. About 40 people attended from India, Latvia, Afghanistan, England, Holland, PNG, USA, Egypt, Malaysia, Canada, Mongolia, Northern Ireland, Armenia, and Australian States and Territories apart from Victoria and the ACT. Meanwhile there is clear evidence that investment in the early years is cost effective4 and yet the expenditure on health, education, income support and social services increases with age in inverse proportion to the potential for long term benefit as shown in the diagram below. With most of the developed world likely to be following the example of the US in expending about a third of all health care resources in the last year of life,5 the HiAP approach will need to do more than invite other agencies to tackle the SDH. This call meshes well with recent developments on sustainable economics, as for example explained by Dr Phil Lawn on this site. 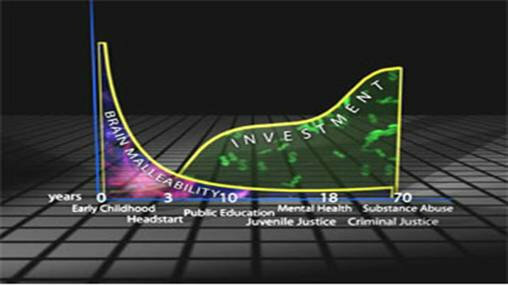 South Australia’s endeavours would be facilitated if healthy public policy was implemented at a national level by adopting the HiAP approach but with a refinement to prioritise interventions that have evidence for long term health gain rather than short term politically expedient returns on investment. * Also the HiAP approach would be more effective if the community demanded it as their right. 1. Puska P. Health in all policies. The European Journal of Public Health. 2007;17(4):328. 2. Puska P, Tuomilehto J, Nissinen A, Salonen J. Ten Years of the North Karelia project. Acta Medica Scandinavica. 1985 Jan 12;218(S701):66–71. 3. McLaren L, Ghali LM, Lorenzetti D, Rock M. Out of context? Translating evidence from the North Karelia project over place and time. Health Education Research. 2007 Jun 1;22(3):414–24. 5. Hogan C, Lunney J, Gabel J, Lynn J. Medicare Beneficiaries: Costs Of Care In The Last Year Of Life. Health Affairs. 2001 Jul 1;20(4):188–95. * A wicked problem is one that is difficult or impossible to solve because of incomplete, contradictory, and changing requirements that are often difficult to recognize. Moreover, because of complex interdependencies the effort to solve one aspect of a wicked problem may reveal or create other problems. # This approach is in distinct contrast to Western Australia that some years ago realised that health care costs were unsustainable. In response to the crisis, all health department activity was prioritised according to meeting the criteria of “immediate threats to life.” This facilitated a sweeping range of funding cuts and reorganisations. * State and Territory Health Directors General and Exec. Directors were invited to Adelaide on the first business day following the Summer School to meet with Prof Ilona Kickbusch, the HiAP Unit and Australian Government representatives to discuss the implications of the Rio Summit on the SDH in October. Update 4/4/2012: Someone did attend from Victoria. Victoria and Western Australia declined the invite.